Kitchens Are Monkey Business: Rosie Has Her Eyes On The Pies. Thanksgiving Pies. Rosie Has Her Eyes On The Pies. Thanksgiving Pies. the food and the fact that no gift-giving is involved. Family, tradition, gratitude, celebration ... yeahyeahyeah-it's all good, but give me the food. I'm happiest in the kitchen anyway, so I consider Thanksgiving as MY holiday. 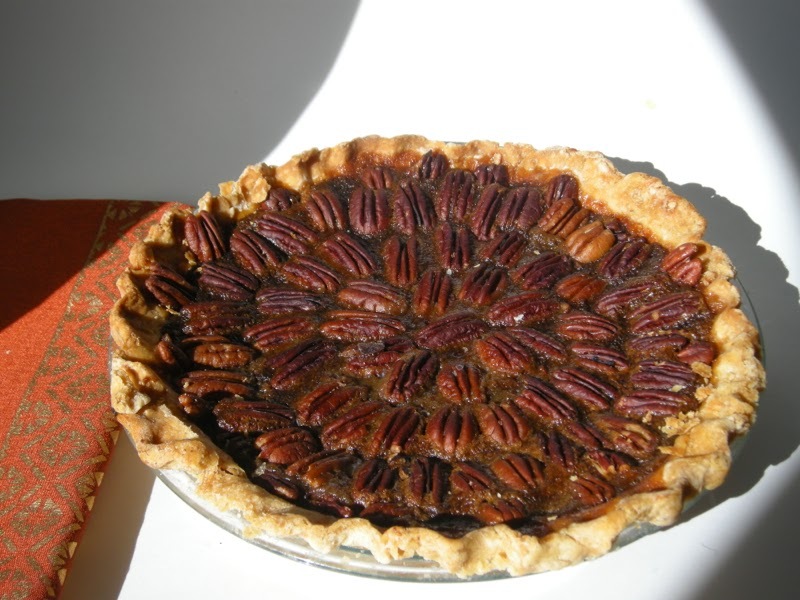 Today I'll be sharing two pie recipes you might consider for your Thanksgiving table - a pumpkin pie and a pecan pie. I've included one of my favorite pie dough recipes, but if you don't want to make your own pie dough, I recommend the refrigerated roll-up doughs that come two to a box, not the frozen pie doughs in the tins, which are smaller and tend to crack. Stir flour, salt, and sugar to combine. Cut in Crisco with a pastry blender or by hand until you have coarse crumbs. Add in egg, vinegar, and water and quickly form into a dough. Flatten into a disk, cover with plastic wrap, and refrigerate for at least 30 minutes. My usual mantra is, “fresh is best,” but in the case of pumpkin pie, I’ll go with canned pumpkin purée any day. It’s consistent. Making homemade pumpkin purée isn’t worth the effort. You must cut, clean, seed, and roast the pumpkin, then you purée it, cook it down, and you must strain it to remove stringy fibers. Even then, you won’t get a texture as smooth as canned. When you buy canned pumpkin, be sure to buy 100 percent puréed pumpkin, not “pumpkin pie filling,” which has already been spiced. As for your spices, fresh is best here. Use freshly grated nutmeg and ginger root to put in bright flavors and take this pie over the top. I have found that the cooking and stirring of the pie ingredients on the stove top produces bolder, more assertive flavors and that the blending of the ingredients results in a smoother, less grainy custard. Arrange the pie dough in a 9-inch pan. Crimp the edges. Place a sheet of parchment paper inside the pie crust. Fill it with dry beans. Bake for 15 minutes. Set aside to cool. Reduce oven temperature to 350°. While the crust bakes, mix the purée, brown sugar, cinnamon, ginger, nutmeg, and salt in a small saucepan. Cook over medium low heat, stirring often, for 8 minutes. Transfer pumpkin mixture to blender and purée about 15 seconds. Add the eggs and yolk, one at a time, processing after each addition. With the processor or blender running, slowly pour in the cream and mix well. Discard the beans and parchment from the crust and pour in the filling. Bake about 1 hour, covering the edges if necessary to prevent over-browning, until center is set. For the leaves, cut dough out with a leaf cutter, place on baking sheet, sprinkle turbinado sugar over top, and bake until golden brown. Cool leaves on a rack, then arrange on top of pie. 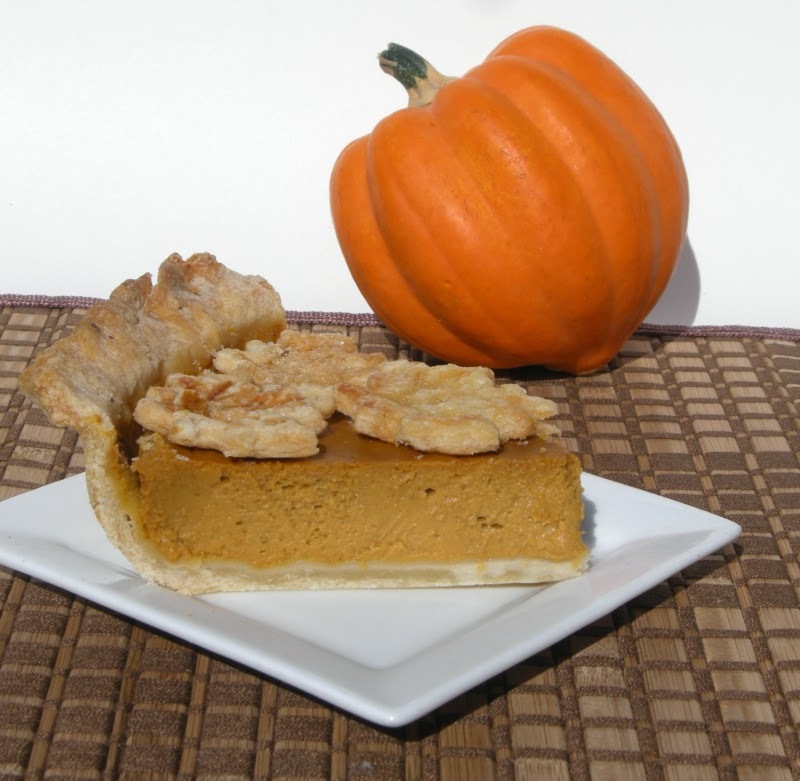 Serve pumpkin pie with a dollop of whipped cream. I don’t remember where this recipe for Pecan Pie came from, but it’s been in my dessert binder for 40 years. It’s that good. Combine corn syrup, sugar, eggs, butter, salt, and vanilla. Mix well. Pour into unbaked pie crust and sprinkle with pecan halves or be very OC and individually place each pecan half just riiiiight. Bake about 1 hour 15-20 minutes, until a toothpick comes out clean. Tent after the first 30 minutes so the edges and pecans don’t brown too much. I like to serve this warm with a scoop of ice cream. Happy Thanksgiving, everyone. Enjoy the bounty and take time to count your blessings. 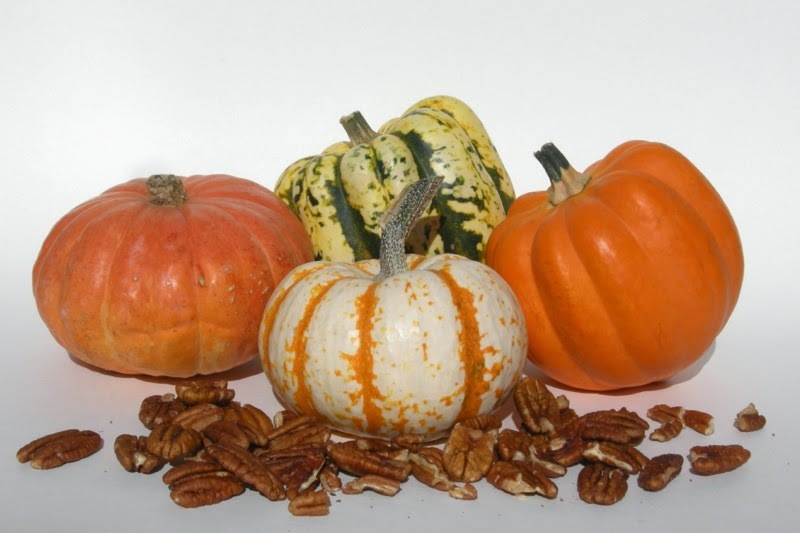 Pecan is my absolute favorite...although I love pumpkin too! Thanksgiving is my absolute favorite holiday. Have a beautiful Sunday evening and a very happy Thanksgiving! Thanks, Tammy! You have a very Happy Thanksgiving as well. I'm in the midst of making a Boûche de Noël for a December column. I think you'll like it! Stay tuned.